Elegant curves of an Early American Sleigh Bed, combined with subtle, modern details of a more contemporary piece make our Amish Journey's End Sleigh Bed a versatile bed that will feel at home in a wide array of bedroom decors! 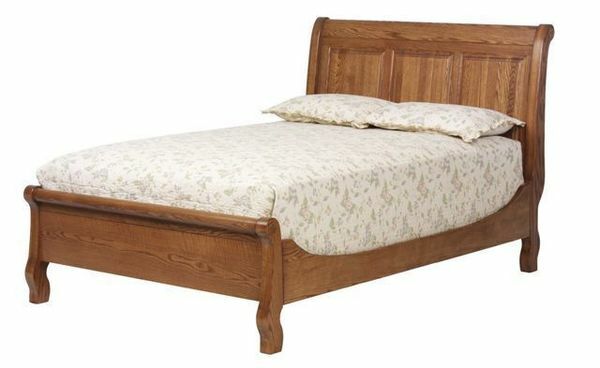 With the large, solid side rails and the bold head and foot board panels, you can truly enjoy the natural beauty and character of your new handcrafted North American hardwood bed. We offer our Journey's End Beds in every size, from the space conscious Twin to the generously sized California King, so you can get just the right bed to fit your unique space! Select your favorite hardwood and compliment that with one of our many stain options, and you're ready to place the centerpiece into your new, dream bedroom suite! Add the matching three-drawer under-bed storage unit for a sleek way to store your linens and bedding where you need them most. Our Amish Furniture Specialists are ready to help with any questions you may have, or to place your order by phone for your new Amish Journey's End Sleigh Bed. We also offer hardwood stain samples to help you pick the perfect bed to match your decor!